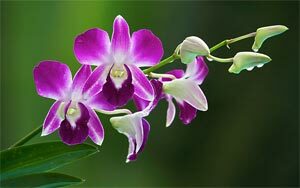 Thailand has an amazing variety of plants and flowers and is world famous for it’s cultivation of orchids. The study of the Flora of Thailand, with its estimated 10,000 vascular plants species, has been gathering momentum in the last few years and has now reached a well-advanced stage. 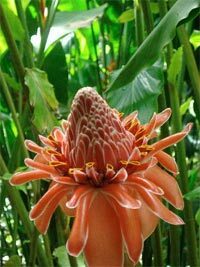 The Flora of Thailand Project, whose aim is to produce a complete floristic treatment of the entire vascular flora, really started to take off the ground around 1958 with the Thai-Danish, Thai-Dutch and Thai-Japanese botanical expeditions. Thailand is one of the most botanically diverse countries in the world with an estimated 12,000 vascular plant species. The southern peninsula of Thailand spans nearly eight degrees of latitude (about 5 degrees N to 13 degrees N) and includes the transition zone between the Indo-Burmese and Sundaland floristic regions, two of the six most diverse and threatened biodiversity hotspots in the world. It has been estimated that over 500 genera of plants have their northern or southern distributional limits within the transition between these floristic regions. Several explanations for why these floras became and remain distinct have been proposed, including the role of great variations in length of dry season that occurs within the peninsula. However, analyses of species distributional patterns have not been possible due to a dearth of plant collections from the peninsula. Thailand’s average of only 50 herbarium specimens per100 km2 pales in comparison to countries such as the United Kingdom (1,720 specimens per100 km2) and is even low compared to other areas of Southeast Asia (e.g., Java and the Malay Peninsula each average nearly 200 specimens per 100 km2).